related titles The unique and most popular feature of the guide is its system of special indexes -- more than sixty in all. They make it easy for parents and grandparents, teachers and librarians, even children themselves, to match the right book to the right child. Browse through the indexes and find titles for every interest and mood: picture books about cats, mice, or dinosaurs for babies; funny books to read aloud to toddlers; series about family life or school or fantasy adventures for a middle-grade child; books on divorce or death; and coming-of-age novels just right for someone starting junior high school. There are also indexes for books about minorities and religion, an age-appropriate reading-level index, and much more. Lavishly decorated with more than three hundred illustrations from representative titles, the guide also features extra-wide margins for notes on which of your children liked which book, at what age, and why. Thus the guide becomes a family reading record as well as an invaluable resource you'll use again and again. 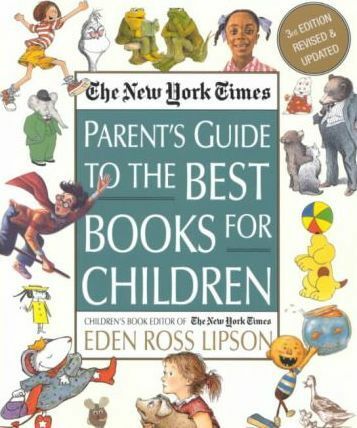 In this third, fully revised and updated edition of The New York Times Parent's Guide to the Best Books for Children, the children's book editor of "The New York Times Book Review personally selects and recommends books for children of every age. The most comprehensive and authoritative book of its kind has been completely updated for the new millennium. It contains hundreds of new entries, many expanded descriptions, and notations of additional companion and related titles -- more than l,700 in all. The best-loved classics of the twentieth century are included, as well as a thoughtful selection of outstanding titles from the last decade. The unique and most popular feature of the guide is its system of special indexes -- more than sixty in all. They make it easy for parents and grandparents, teachers and librarians, even children themselves, to match the right book to the right child. Browse through the indexes and find titles for every interest and mood: picture books about cats, mice, or dinosaurs for babies; funny books to read aloud to toddlers; series about family life or school or fantasy adventures for a middle-grade child; books on divorce or death; andcoming-of-age novels just right for someone starting junior high school. There are also indexes for books about minorities and religion, an age-appropriate reading-level index, and much more. Lavishly decorated with more than three hundred illustrations from representative titles, the guide also features extra-wide margins for notes on which of your children liked which book, at what age, and why. Thus the guide becomes a family reading record as well as an invaluable resource you'll use again and again. EDEN ROSS LIPSON has been the children's book editor for The New York Times Book Review for more than fifteen years. She has raised four children and lives in New York City.